A simplistic take on the McCarty that, with its all-korina construction, celebrates not just Ted McCarty but also 50 years of his korina Flying V and Explorer. Typically high-quality build, resonance and sounds. Less-posh vibe. Not as 'wide' sounding as the McCarty. Slightly less versatile. 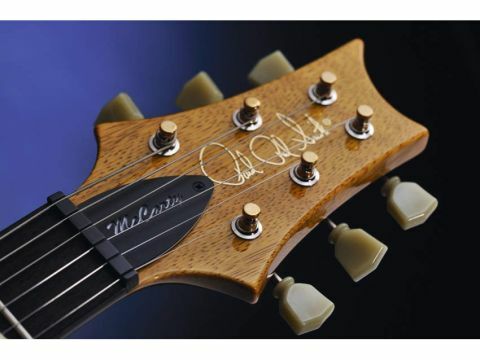 In 2007 PRS released a limited run of 500 Korina McCartys with Brazilian rosewood fingerboards. This non-limited model lacks the scarce and expensive Brazilian rosewood, replaced here with PRS's standard issue Indian rosewood. In typical PRS fashion our sample has a one-piece korina body and one-piece quarter-sawn neck of the same yellow-hued, mahogany-like wood. However, both two-piece and three-piece body versions are also being made. "The pieces of wood are related to what we have on that day as far as width," explains PRS's Joe Knaggs. "It's not common to have one-piece korina bodies. Most of the wood is pretty skinny, so it usually has to be three pieces. A lot of old Strats were five pieces." But we can't help thinking that it's these one-piece 'uncommon' Korinas that'll be most sought after, irrelevant of the effect - if any - on the guitar's sound. You might also think that the one-piece bodies would be used for the natural finish versions and the three-piece bodies used for coloured finishes but that, apparently, isn't going to be the case. The use of Korina adds a classic, stripped-down appearance to the guitar. There's no maple top and the body dimensions are the same as the standard McCarty - the thickest double-cut PRS makes. The neck is limited to a wide-fat profile, with its hint-of-a-V, feeling a little broader and bigger than a DGT McCarty, for example. The finishing, as ever, is faultless and appears very thin indeed. A perfect weight, the Korina has a to-die-for ring and resonance that should be the foundation of any great instrument. Although everything else is standard - the covered humbuckers, single volume and tone pots plus coil-splits, stop-tail bridge and moon inlays - the brass-post Kluson-style vintage tuners are a first, joining the brass-post Phase II lockers first seen on the Mira as the default PRS tuner. We warmed up our bench-test amp with a 2007 maple-topped McCarty to put us in the expected ballpark. It's one very fine guitar: vintage and open sounding with a great neck pickup. The McCarty Korina should sound pretty similar and there are certain likenesses, but it's a darker, more closed tone with plenty of mahogany-style grunt and less width courtesy, we'd wager, of the absent maple top. Swapping between the two, the new Korina seems a little hotter in terms of output and we wonder if some slight pickup tweaks have occurred. There's a little more girth to the Korina's lower end too and overall it has less sophistication than the maple-topped McCarty. PRS is rightly revered for making consistently excellent, frequently exceptional, electric guitars. But the Maryland company is also gaining a reputation for continuous change at a pace that is hard to keep up with. As of 2008, the maple-topped McCarty joins a long line of now discontinued models, replaced with the McCarty II with its active circuitry and the more plain-Jane McCarty Korina on review here. In isolation the Korina is a fantastic piece, a very pure, straightforward distillation of the McCarty concept devoid of any price-hiking bling. Yet is it a better guitar than the standard McCarty? We don't think so.